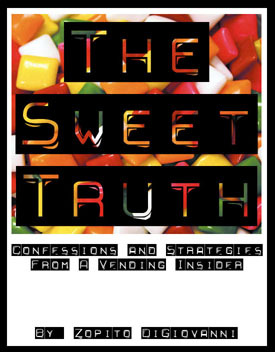 If you're considering the bulk candy vending business, or if you are in the business already, you can't afford NOT to buy this book!!! Are you tired of all the "fluff" vending ebooks out there with little to no technical information? So am I. I've read several other ebooks on bulk candy vending, just to find they were filled with generalizations and "fluff". Not to mention double spaced and printed in a 14point font! This book is more than 50 pages of detailed information and it is single spaced in a 12point font. I'm not trying to impress you or sell you a whole bunch of stuff. I'm just going to tell it to you like it is. You may not like everything I have to say, but I'm not trying to get you to like me. I'm dedicated to providing you with the most detailed and most accurate information that you will find about the bulk candy vending business. This book will provide you with a look at the business from an insider's perspective. In one bulk candy book that I read, the author even said "I won't bore you with the details" several times in several sections of the books. (I'm not mentioning names here...) That made me upset. I felt ripped off. I wanted the details. That is why I bought the book in the first place! When I got started, I bought several books and audio programs on bulk candy vending that claimed to tell all there was to know about the business. SURPRISE! They were filled with unrealistic income projections, generalizations, and such a lack of detail that I questioned weather the authors REALLY made money in the bulk candy business or more likely, if it was just a hobby for them. Even though I did all the research I could before getting into the business, I was not prepared. I had to learn the hard way. This book will save you thousands of dollars and pay for itself many times over. I would have gladly paid several hundred dollars for this information when I got started... but it hasn't been available until NOW! The beautiful thing is that you don't have to learn all this the hard way like I did. The majority of the information in this book cannot be found anywhere else. I've optimized my route so that I am making more money per machine than the industry average and I am spending less time than other people I know in the business. How much should you pay for vending machines? Expect to spend $300 each if you go to any of the big companies and buy them new. I've bought the same machines and I regularly pay $25-$50 for a triple-head vending machine. I have never paid more than $50 and I would not pay more. This business just doesn't make financial sense if you spend that much on equipment. I will explain where to look for these deals. I know someone in the business with a route the same size as mine, and he is always running behind and can't even find the time to talk on the phone. I have lots of time to spare, and I will explain exactly how I was able to optimize my route to make this possible. Because of this, you can't afford NOT to apply the techniques I describe in this book! I've bought routes from people who explained that after they got into the bulk candy vending business and realized the truth about the business, they decided that servicing their route was not even worth their time for the amount of money they were making. Why is this? Because they were doing it all wrong! Is bulk candy vending considered passive income? Chapter 3 - Is Bulk Candy Vending right for you? How often should you service your machines? What to do about Ants?! Chapter 14 - What Next? All of this for only $29!!! "Just wanted to let you know that I bought your book and Loved it. I bought a small route. I did this roughly 72 hours after reading your book. I got a total of 22 machines and 10 of them were already placed. I paid $1200 so not to bad of a deal. Today I purchased another 10 machines for $45.00 per machine." "Zo, wanted to thank you for "the-sweet-truth". It has really helped me a lot. I bought 141 Vendstar machines for a total of $4500.00!! Looking forward to staying in contact with you." "To anyone that's looking to get started in the bulk vending business, THIS IS THE BOOK! It contains just about everything, and basically, any questions you have will be answered by reading this great book! I recommend purchasing it!" "My wife and I decided to supplement our income with a small bulk candy vending route. After weeks of internet research, I had compiled a dozen different e-books and resources to help us get started. Most were helpful but lacking in daily operations management. Not so with THIS BOOK. For anyone wanting a road map to bulk candy vending success, THIS is the tool. From purchasing equipment and locations to the daily route management tools, everything is here for our success. By the way, we bought our first set of machines @ $50 each utilizing the knowledge we gained from THIS BOOK. They are new, never been placed 1 800 Vending Triples. Thanks again for the great resource. THIS BOOK should be required reading for those entering this type of business." "Your truth and insight made all the difference in the world. Thank you for your book. very valuable information for anyone looking to get into the business of vending." "I have now read the whole book and extra attachments and have started acting on it. I tend to over-research something before I get involved. Of all of the research I have done, this e-book was the best and most concise overview of the bulk-vending business. There are tips in there that obviously will save you much more money than the cost of the book. In fact, by giving the real numbers and real story of the vending business, it may even save you money by NOT getting into the business. Do it if it is right for you and beware of suppliers and locators." This information is not available anywhere else. You can't afford NOT to buy this! This information would have saved me thousands of dollars if it were available when I got started! P.S. - You can still learn the hard way if you would like, but this book will save you thousands in money, time and aggrivation. The choice is up to you.